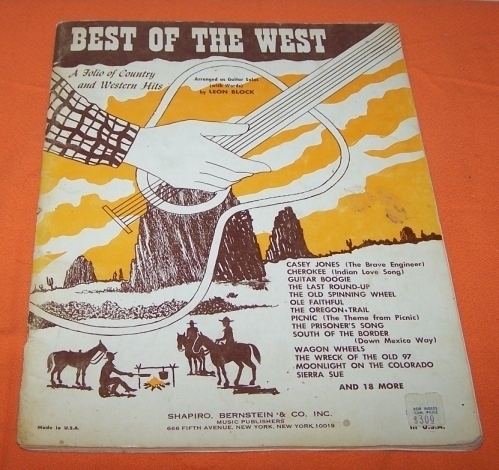 Seller WILL SHIP WORLDWIDEESPECIALLY TO THE USA The Best Of The West" Music Book Of Western Hits 48 Page - Hits By Leon Block - Copyr. MCMLXVII --Sold as Seen Favorites Tunes for everyone. Notes and Text - You Certainly will find a few of your Favorites in this book. Also Accordion Music Books and Fabulous Accordions Listed Comes from A None Smoking Home - Many other Great Slightly Used Items Listed- Please check them out Item Sold As Seen Privately - There is no Guarantee Exchange or Returns available on this Item Ask any question before Bidding Please Item is described to the fullest of my knowledge ! If in doubt Please feel free to email me if you have any questions concerning this Item. If any delay in shipping should occur it is completely beyond my control and entirely in the hands of the Postal Agencies involved. All Deliveries go by Surface Mail Postal delivery can take 10 to 14 days in Canada or USA I Reserve the right to take up to 3 working days after payment is cleared to ship the item Shipping Cost to USA or Canada 5. . A Final Invoice will be sent to you at end of Auction Preferred Payment Options Are: Cash by Registered Mail- Money Order or Personal Cheque.